Editor’s note: Atherton resident Gillian Bostock is not only a talented, serious-amateur chef, she’s also an accomplished photographer. This is the fourth in her series of great summer recipes. This particular recipe takes me back to a little restaurant on a cobblestone street of DUMBO, a neighborhood just across the Brooklyn Bridge from Manhattan. It was there, while sitting at the bar, I had a delicious meal of Littleneck clams in a saffron-infused broth followed by a large, perfectly cooked rib-eye steak. Though it was mid-March, New York was still clinging successfully onto winter and I was hungry. 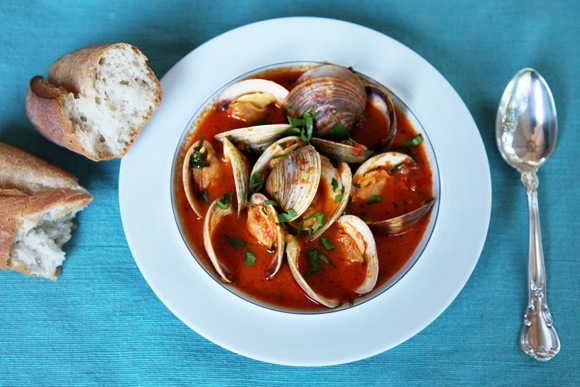 The clams were particularly memorably and, a few weeks later, back in California, I found myself eager to recreate their delectable taste. I can’t promise you that this is exactly what I had then but I can tell you that I have had very happy dining companions when these clams were on the table. 1. Clean and rinse clams and check that they are all closed. Discard any open ones. 2. In a large pot, heat butter until completely melted and hot. Add minced shallots and sauté for a few minutes while stirring until clear but not browned. 3. Add white wine and reduce by half. 4. Add tomato paste, tomatoes, clam juice, and spices. Season with salt and pepper. Simmer for several minutes to thicken. 5. Add cream and stir to incorporate. 6. Add clams and cover. Cook for approximately 7 minutes on medium-high heat or until all clams are open. Sprinkle parsley over the clams and stir gently. Serve in a soup bowl with an extra bowl on the table for empty shells. Question… when do you add the saffron? Add the saffron at step number 4 with the rest of the spices. Also, an extra tip: To clean the clams (step number 1) soak them in fresh water for about 20 minutes. This will give them a chance to release the sand that’s been caught inside. Pull each clam out of the water one by one, discarding chipped or open ones. The sand will have collected at the bottom of the bowl and you don’t want to carry that over to the pot. Enjoy! This is one of my favorites! Next post: Spotted: Sharon Park’s pond is back!